crucial to avoid catastrophic failure of the chimney and increase its lifespan. One widely accepted design for doing so is the use of hydraulic dampers installed between the top of the chimney and a steel ring. 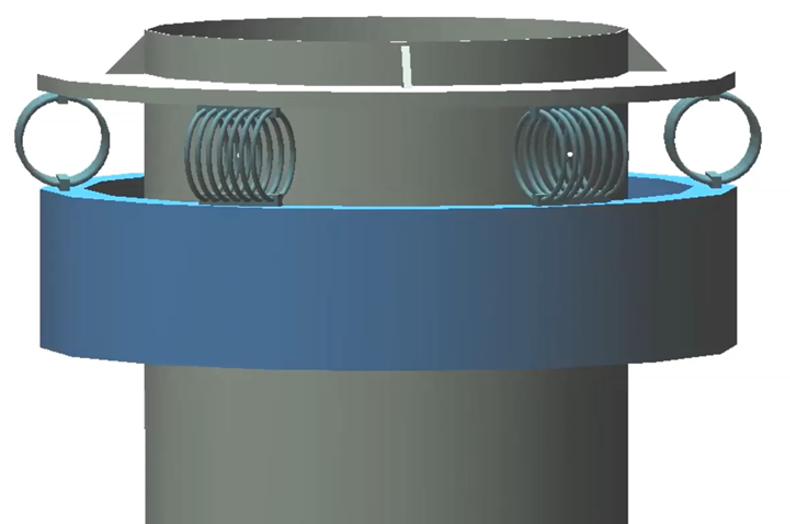 While this is an effective design at limiting a chimney’s vibration, it often requires maintenance, and its performance could vary based on temperature. A less known way of controlling chimney vibration is through the use of wire rope isolators (WRIs). When tuned to the proper stiffness and damping, WRIs can be very effective at controlling the chimney’s vibration. In addition, WRI-tuned mass dampers (TMDs) offer further advantages such as their maintenance free construction, temperature-independent performance, and extremely long lifetime. Our purpose here is to present a case study where the Socitec Group provided a WRI based TMD for a chimney stack. The simulation results show that just like hydraulic dampers, WRI TMDs can be very effective at controlling a chimney’s vibration.